for just £9.99 delivered or £5.99 oncollection - so you can experience the great Domino's taste for less. It's as simple as that! *From the menu or create your own up to 4 toppings. Premium bases and crusts will be charged as extra. When ordering by phone please mention offer when ordering. To order on the website you must click on the meal deal section and order from there. Not valid with any other offers. Valid at participating stores only. Offer is subject to availability and can be withdrawn without notice. 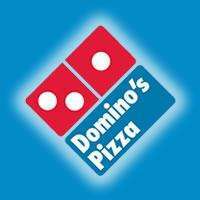 our page 'boring legal stuff' at dominos.co.uk." Not at my Domino's, select areas only clearly. Bad luck. Doesnt look like its available in Aberdeen. Good deal for those who can get it, maybe you should add the area(s) into the details so people will know where they can get it from. I think the OP stating the local store where it IS available is far more relevant. Think this is happening in Stoke (Hanley). Got an advert for it but the dates were 16th-20th. Guess they might be doing a more nationwide promotion? I dunno! But yea, Hanley is £9.99 delivered or £5.99 collection(might of been 6.99 but not in a position to check right now) Weds-Sunday. Don't think its justified to vote something cold just as its not available in certain areas. Still a hot deal for those who can get it ;-). Is avaliable in high wycombe, we always get people standing around town will billboards saying the offer. i can confirm that stores in Dartford, Crayford and Swanley are doing any pizza any size £9.99 delivered and £7.99 collection. i know coz i work there and the owners own these stores! Doesnt look like its available in Aberdeen. Good deal for those who can … Doesnt look like its available in Aberdeen. Good deal for those who can get it, maybe you should add the area(s) into the details so people will know where they can get it from. Worked for me when I put in my aberdeen postcode. Just have to click on the "Deals" button. "Domino's Mega Deal! Any Size Pizza £9.99 *Delivered* Starts today, ends this Sunday!.."